If someone asked me, what is the best about Finland or Finnish my first thought would be nature. Nature is important to Finn. There are so many forests and lakes in Finland. We have got used to, that there is only short walk to nearest forest in Finland. It is privilege that we have so many forest, because short walk to forest may be rarely in some other countries. It is also great that many of these forests and lakes are public, so everyone has possibility to go to walk in forest, pick berries or swim on the lakes. I think that our love to nature tells us that we appreciate clean air and environment. It tells us also, that sometimes we need stillness and time for ourselves. The forest is place to calm down, forget the rush and turn off the phones. I think Finnish nature is very beautiful in every season although we have long and dark fall and winter. Finnish food isn´t the most popular or tastiest compared to other countries food, for example there are many jokes about mämmi, the traditional Finnish Easter food. Spices don’t belong to traditional Finnish kitchen. Traditional Finnish Food is simple and flavoured only with salt and pepper. I think that long family dinners aren`t so popular on weekdays in Finland. Finnish people eat often only with family members and don`t invite friends and neighbours to dinner. I think that home is place to be oneself for Finns and that`s why dinners with neighbours aren`t so popular. Home has also to be clean and perfect, if someone is invited to visit. I guess that is very Finnish thought. But if a Finn invite you to dinner or cup of café, there are so many foods and pastries and almost everything has to be eaten. I think Finland is a very good place to live. Maybe it is because I am used to live there, but I also think it is great how everything works here. For example we have a high quality of education. Even though the world is getting crazier every day, I feel Finland is quite safety and peaceful place to live. We don’t have massive earthquakes or some other natural catastrophes here. We have a beautiful nature there, which is one of the most important things for me here. Finland is a land of thousand lakes and forests. I live now almost in the middle of the city, but I can still see trees and plants on my window. Climate here is a very variable. In winter we usually have snow on the ground and almost minus twenty degrees. In spring, summer and autumn it might be hot weather, or rain or snowing or anything at all. Last but not least, I would like to also say few things about people who live there. 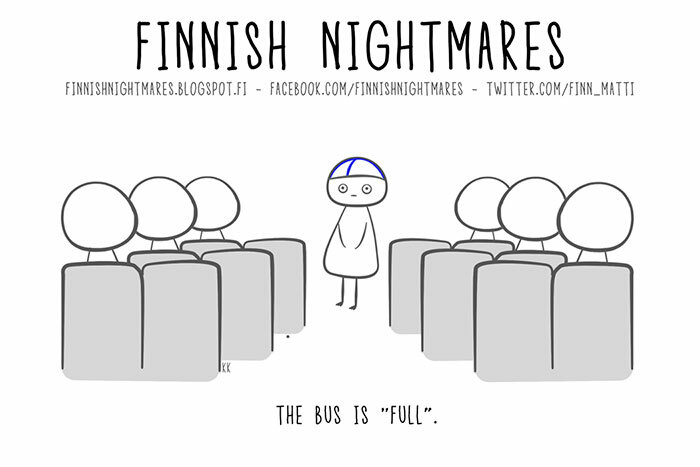 Finnish people are often called shy and quiet. We don’t talk with strangers on the bus stop or sit next to someone you don’t know in the bus, if there are any free places left. I am Finnish so I do those things for myself too, because it is maybe part of our culture and behavior. Silence doesn’t mean that someone is rude, of course we speak if someone ask something. In my opinion, that is not a bad thing, because we have some other important features like honesty and punctilious. Finland and Finnishness are so many things that it’s hard to put them in to one blog text, but I’ll write about the things that matter the most for me personally. And that is our nature. Almost everyone else has also brought this up but it’s simply because it’s our greatest and purest thing. For now, at least. The most important things about our nature are big forest and field areas, and of course our lakes. I’m originally from the countryside and I believe that it has a big influence in my love for nature. Even if I live in the city of Tampere right now, I must walk less than a kilometer to get in the forest. And I just love that. This foto is from Tampere near my home. Like I mentioned, with that great nature comes water and that water we have plenty. And it is clean. When you have travelled a lot of different places, you notice that not in very many countries can you drink the water that comes in to our homes and houses. Of course, that is because our water cleaning system is ahead of some others. Main point is still a water you can drink without dying, and after that, the fact that our country is advanced for example in things like water cleaning. This foto is from our summercottage in the island of Attu. I think that also our school system, healthcare and social services deserve own little chapter. Of course, there is always something to do better and could be cheaper and stuff like that. But fact is still that you cannot get these kinds of services almost anywhere in the rest of the world in this way that we have them. There is little something I hope that will change. Peoples appreciation towards our services. Like I said at the beginning, there is so much to write about but now I’m gonna end it here. I hope that my writing is readable, thank you for reading and all the pictures are taken by me. My exchange has already started when I am writing this so my perspective to Finnishness has already changed little bit. I want to write you about things what I seem to be missing from Finland. Finland is known from its lakes “Land of a Thousand lakes”. Before my exchange I had no idea that I could be missing lakes, but seems that I am really used to swimming. Lakes also seems to be meeting place with friends, a place to gather around and relax. This was my first summer away from Finland and I missed Finnish mid-summer party, which usually includes lake, swimming, tasty food and bonfire. I was seriously considering flying back to Finland just for midsummer, but finally I did not. I guess next year I must celebrate twice as much. In Finland I was used to eating rye bread and porridge, but they seem to be really hard to find here or they are really expensive. Of course idea is to experience local culture and food, but my eating habits seems to be hard to change. Before my exchange I did realise that these are things which I would miss from finland, but that seems to be the case here. I guess these things are “Finnishness” to me. Things that pop into my head when thinking about Finnishness and being Finnish are nature, Finnish food and personal space. Of course, there are a lot of more things that I could mention but these are the few that I want to focus on. First of all, the Finnish nature. I don’t know a better way to describe it than saying it´s really beautiful. One of the reasons why a love Finland is because of its forests and lakes. I have heard foreigners speaking about Finland that how fascinating it is when you go to Finland and there are lakes everywhere and that is true. There are around 187 888 lakes in Finland and that’s a lot! It´s nice that in the summer you don’t usually have to go far to find a lake. Of course, it depends where in Finland you live but I would say mostly you can find lakes close to your home. When I think about Finnish food nothing special dishes comes to my mind but we do have some extremely good candy, salmiakki. It´s a salty liquorice which most of the Finnish people love and foreigners hate 😀 It´s one of my favorite candies and every time I get an opportunity to offer it to someone who has not tasted it I do it. People’s reactions when they taste the candy are funny to watch. Usually they can’t eat it. Another thing which I love about Finland is rye bread. It´s not only good tasting but it’s also healthy. I think that is one of the things I´m the proudest as a Finnish person. Sounds a bit silly but in abroad it can be hard to find good healthy bread and not just toast. But it´s just something that I´m used to. If I would have been born somewhere else, I might not like it. What does Finland and being a Finn mean to me? The answer is – if I dare say – something that a lot of Finns could very well relate to: sauna, sisu, lakes and rivers, lots of trees, silence, and space. A Finns favourite scenery often has water in it, be it a lake, a river or the sea and perhaps some trees or some other kind of vegetation. This isn’t surprising since Finland is often called The Land of a Thousand lakes. It does describe Finland well because if you’ve ever driven through Finland during summer, all you can see is blue lakes, rivers and green forests and fields passing by. As lakes are everywhere, so are the summer cottages too. To me and a lot of Finns, retreating to the cottage during summer is a very important thing. The peace and quiet and the simple joys that the of the cottage offers is what makes them so attractive to Finns. Relaxing at the lakeside boating, fishing, barbecuing and most importantly going to the sauna and swimming are a must. Sauna has been an important part of the Finnish culture for hundreds of years. It has been a place for bathing and curing different illnesses, but also a place where children were born and where the corpses of the deceased were taken before the funeral. Nowadays practically all houses and many flats have a sauna of their own and it is common practice to use it at least once a week. I’m originally from Rovaniemi, and after moving to Tampere I have come to really appreciate the two extremes that especially Lapland can offer. Snowy, cold and dark winters and the warm, green summers with the sun shining the whole night through. The difference in the light in the summer is very noticeably compared to Tampere even though Rovaniemi is in the southern part or Lapland. In this blog a lot of people have talked about the Finnish people and our nature which is often silent, sometimes even a bit awkward, shy and always very straight to the point. Maybe because of the harshness of the the environment we have had to live in we have had to develop a strong mentality of perseverance, sisu. It is an attribute that has helped us survive in the sometimes tough but beautiful nature surrounding us, but also other kinds of difficult situations in the past and the present. It is an positive attitude I can relate to and hold very dear, and I do think it somehow sums up what Finland and its people are all about.